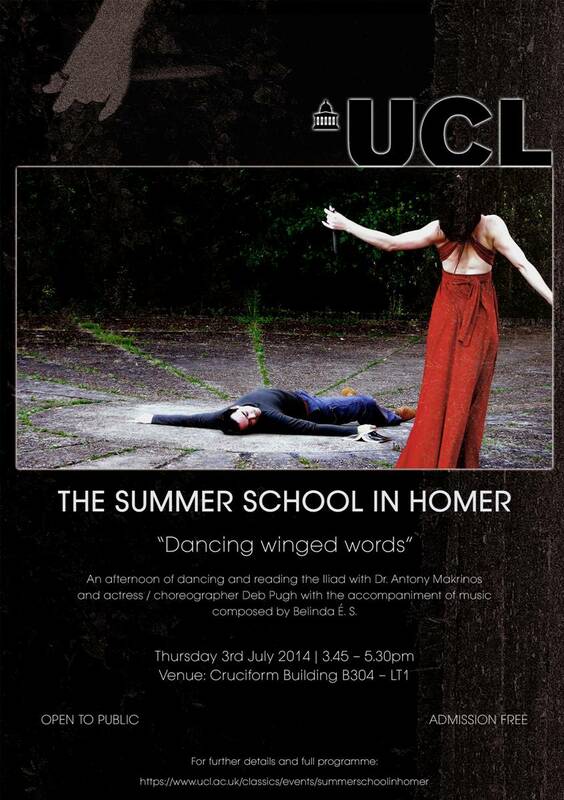 Returning to UCL’s Department of Greek and Latin, Anastasia Bakogianni talks with Dr Antony Makrinos about his initiative to organize a summer school devoted exclusively to the study of Homer (30 June – 4 July 2014), open to a wide range of participants including schoolchildren. The highlight of the 2014 summer school was a performance of key scenes from The Iliad by actor and choreographer Deborah Pugh who collaborates with Theatre ad Infinitum. Antony worked closely with Deborah to bring the Homeric text to life. Their goal was to appeal to the audience’s emotions and to remind them that the Homeric epics were originally designed for performance. Follow this link to watch our interview, and to learn more about this exciting collaboration between a classicist and a physical performer. Previous Previous post: Feedback time!